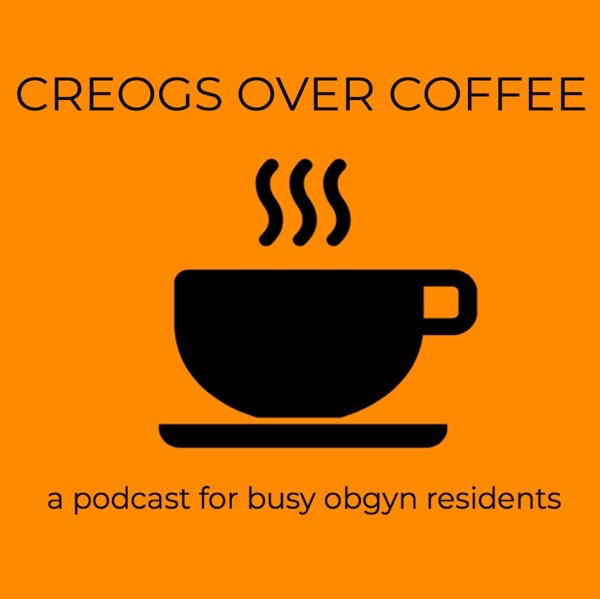 A CREOG study podcast for the busy Ob/GYN resident! 10 minutes of knowledge for your drive into work or while you’re savoring that cup of Joe. Make sure to find us on iTunes, Google Play, or Spotify as well! Fei and Nick bring on Dr. Benjamin Brown, an assistant professor of Obstetrics and Gynecology at the Warren Alpert School of Medicine/Women and Infants Hospital and Family Planning specialist to discuss different types of progestins. What do different of generations of progestins do? How should they be prescribed? Find out on this episode! Come check us out on social media! Fei and Nick speak with Dr. Jeff Sperling, former Brown Ob/Gyn resident, now a third year MFM fellow at UCSF. He talks about the importance of the patient in the practice of medicine, and discuss women's health in general. Nick is back with our lovely fairy godmidwives, Liz and Linda to talk more about electronic fetal monitoring. This week, we discuss management of category 2 and category 3 tracings in labor. Fei and Nick discuss LA sporting teams with Dr. Larry Platt and talk about his extraordinary path to MFM. This week, Nick flies solo as he interviews Dr. Nathan Riley, a palliative care fellow at the University of California San Diego regarding palliative care and pain management in Ob/Gyn. Welcome back everyone! Today we interviewed Dr. Sean Blackwell, current president of SMFM. Dr. Blackwell talks to us about work-life balance and reading, as well as gives us good advice for advancing in our careers. This week, Nick and Fei are joined by Dr. Kyle Wohlrab, an associate professor of Obstetrics and Gynecology at the Warren Alpert Medical School and urogynecologist at Women and Infants Hospital. We discuss stress and mixed urinary incontinence, including how to diagnose and begin to treat these disorders. Fei and Nick are joined by Dr. Vincenzo Berghella, Director of the MFM division of Jefferson University, and past SMFM president. Dr. Berghella talks to us about happiness, finding time with his family and friends, and the importances of doing what you love. Today Fei and Nick take a step away from the obstetrics world and go back to gynecology! They interview Dr. Warren Jay Huber, a third year REI fellow at Warren Alpert Medical School and Women and Infants Hospital about the menstrual cycle! If this cycle confuses you too, take a listen as Dr. Huber clears up all those different hormones and phases. Nick and Fei talk to Dr. Stephanie Ros from University of South Florida about changes in going from a resident to a fellow. Today, Fei and Nick sit down with Dr. Benjamin Young, a third year ophthalmology resident at Yale, who talks about vision loss in pregnancy. If you're like Fei and Nick and don't remember anything about the eye from medical school, Dr. Young breaks it all down. Nick and Fei interview Dr. Grobman. How did he think of the ARRIVE trial? Does it now mean that we need to induce all nulliparous women at 39 weeks? What is Dr. Grobman's favorite opera? Find out on this episode! Today, we have Dr. Christopher Nau, Maternal Fetal Medicine fellow at Brown University, discussing fetal growth restriction. We go through diagnosis, management, and delivery options for patients with fetal growth restriction. Nick and Fei interview Dr. Cynthia Gyamfi from Columbia University. They discuss how Dr. Gyamfi got into Ob/Gyn and MFM as well as talk about books for book club! We got some great feedback after our espresso episode on treatment of acute hypertension to go ahead and make an episode on hypertensive disorders of pregnancy. This is a HUGE topic, so here we are with THREE episodes instead of one. Hope this helps your studying! Also, a huge shoutout to Dr. Yalda Afshar, who recently became a $10/month patron on our patreon! Thank you for your support, Dr. Afshar! Also, a special shout out to Dr. Christina Han, who recently became a $20/month patron on our patreoon. Thank you so much for your support! Nick and Fei are at SMFM this week and have lined up a bunch of interviews with their MFM heroes. Here is the first episode with Dr. George Saade. Dr. Saade talks to us about his interests, his advice on going into medicine, Ob/Gyn, and MFM, and also gives us a brief overview of his favorite opera: Don Giovanni! Almost at the end of our STI saga! Only two more episodes after this. Today we will discuss pelvic inflammatory disease, and everything that goes with it. When should you hospitalize for PID? Should you surgically intervene for a TOA? Find out on today's episode! We also have a very special announcement. We are teaming up with the ObG Project to bring you more amazing content. The ObG Project is a completely free online resource that brings you clinically relevant information in a succinct and convenient way. Even more exciting, we are happy to announce OBG First: a resource that brings these clinical summaries directly to your phone via text or email. This service is completely free for fourth year Ob/Gyn residents for a whole year. Hi all! So Nick and Fei were at SMFM this past week, and were able to record 12 interviews with amazing people like Dr. Sean Blackwell, Dr. Cynthia Gyamfi, Dr. William Grobman, and many more. Here is a preview of their interviews. We will be posting interviews every week, but if you want access to them now, you can become a patron on our patreon! And... we're back to our STI saga! We'll be discuss genital herpes today, some come give us a listen. Nick and Fei get into the nitty gritty of the pathophysiology, diagnosis, and treatment of this STI. Today we're taking a break from our STI saga, but don't worry, there will be more to come! Instead, we're veering back into the world of obstetrics with two of our lovely midwife clinical educators: Linda Steinhardt and Elizabeth Kettyle! They will be teaching us about electronic fetal monitoring and discussing the five components that make up cardiotocography. Also, a very special announcement: both of us will be at SMFM! Come and hit us up at Caesar's Palace, where we'll be handing out business cards, and if you're lucky, you'll catch us recording! We're going to be Las Vegas the week of 2/10-2/17 for SMFM. Fei will also briefly be at APGO/CREOG on 2/28 in New Orleans. If you have time, come find us and say hello. We'll be hanging at the poster sessions and getting the scoop on the latest and greatest at the meeting. Best of all, we'll be recording to get that information back to our awesome Patreon subscribers. Come find us, and you may end up on the podcast! Here is our second espresso episode on treatment of acute onset severe hypertension in pregnancy and the postpartum period based on the new ACOG committee opinion 767. We will be posting more on our website as well. Today, Nick and Fei continue their STI saga and cover syphilis. Come and listen to find out about all those strange tests that are out there. Also, what is ocular syphilis anyway? We're giving a shout out today to Dr. Christopher Morosky. Thank you for your $20 a month contribution! Congratulations! You just finished CREOGs! But that doesn't mean you shouldn't keep studying! Today Nick and Fei kick off their STI saga. First on the list are two common infections: gonorrhea and chlamydia. Come take a listen to find out how to diagnose and treat both types of infections in pregnant and non-pregnant women. We're giving a shout out today to Dr. Ilina Datkhaeva, MFM fellow at UCLA and previous Brown resident, who recently became a $10 a month patron. Thanks Dr. Datkhaeva! Today, we interview Dr. Erin Cleary, Assistant Professor of Ob/Gyn and Clinical Educator at the Warren Alpert School of Medicine, about breastfeeding! This is a topic that we (and our patients) have heard a lot about. But what are the myths and what are the facts? Dr. Cleary teaches us about the anatomy of the breast and the physiology of breastfeeding! Also, we give a shoutout to our very first patron on patreon: Dr. Daniel Ginn (sorry about the dad joke using your name)! Hi everyone! Guess what? We've started a Patreon! Turns out, podcasting is a lot of hard work and costs a lot of money, and Nick and I are residents just like you. We love podcasting and want to keep doing it, but we need your help. You can help us out as much as you'd like, but know that we are going to be giving some special prizes to our monthly contributors. For $20 a month: you'll get the above and a special CREOGS Over Coffee Mug! For $50 a month: you'll get the above and a CREOGS Over Coffee T-shirt! Come check out the patreon. We love and appreciate all of you! Happy New Year! Nick and Fei are back again with Dr. Eger. This time, we talk about the treatment of vasomotor symptoms of menopause and the Women's Health Initiative. It's almost the new year, and we're less than a month away from CREOGs! We have a special guest with us again, today: Dr. Renee Eger, an assistant professor and clinical educator at Brown University. Dr. Eger is also an expert in menopause and will be talking to us today about the vasomotor symptoms of menopause. Join us next week, when we discuss the Women's Health Initiative Study and even more with her! This is the third and final part of our series on gestational diabetes! With another venti episode, Fei and Nick interview Dr. Donald Coustan, Professor Emeritus of Obstetrics and Gynecology at Warren Alpert Medical School of Brown University and giant in Ob/Gyn. Here is Part II of our three part special on GDM, just in time for the holidays. Join Fei and Nick as we explore the management of antepartum and intrapartum GDM! Here is Part I of our three part special on gestational diabetes! On this episode, we give the definition of GDM, the diagnostic criteria, as well as the risk factors and complications of GDM. Stay tuned for Part II, where we discuss management, both antepartum and intrapartum! Here it is, part 2 of our statistics and study design series! If you're like us and need to review this topic 30 times, come give us a listen now, but also right before your exam in January! Our next two episodes will focus on those pesky statistics and study design questions on the CREOG exam. So today... get ready for the exciting world of sensitivity and specificity! We'll be covering much more on statistics today and next week, but if you're like us and need to review this topic 30 times, come give us a listen now, but also right before your exam in January! This week's episode was based off of the suggestion of Dr. Katie Smith on Twitter. We discuss the physiology of bone mineralization, the risk factors for osteoporosis, the DEXA scan, the FRAX score, and some treatment options for osteoporosis. Take a listen, and remember: Got milk? We can't believe that this is our 10th episode ever! To celebrate this event, we have invited our first special guest to come and talk to us about perioperative care! Dr. Lauren Stewart is a second year urogynecology fellow at Brown University, and has published a two-part series on perioperative care in "Topics in Obstetrics and Gynecology." We will be posting the link to her journal articles on our website. Sit back, keep digesting those Thanksgiving leftovers, and take a listen! Perhaps one of the most common things we see here at Women and Infants Hospital: nausea and vomiting of early pregnancy! Today we go over the diagnosis of hyperemesis gravidarum, talk about the reasons women get nauseated with pregnancy, and ultimately go over the multiple lines of treatments. We are debuting our first espresso episode! What is an espresso episode you ask? They're going to be just like an espresso: short, sweet, and just as action-packed. They will go over more familiar topics, intended for rapid fire review... maybe like when you're on the elevator running to a postpartum hemorrhage? Big shout out today to Andrey Dolinko, MD, who suggested this topic. We will be reviewing the diagnosis, pathophysiology, and management of polycystic ovarian syndrome. Did you think we would be finished with Fei and Nick's Fabulous Adventure Through Pregnancy? Nope, there's more! Today, we talk about the differences between prenatal screening and testing, and walk you through some high yield aneuploidies. We also talk about some of the different screens and tests that we order for our patients during pregnancy. This episode will be a continuation of Fei and Nick's Fabulous Adventure Through Pregnancy. Today, we will focus on the new OB visit, specifically on the patient's history and identifying risks factors for the pregnancy. We also go over the methods of dating a pregnancy. As a follow up to last week's episode, we will be talking about how the cardiovascular, pulmonary, renal, and gastroenterology systems change in pregnancy... all in less than 15 minutes! Come and join us for the second part of "Fei and Nick's Fantastic Adventure through Pregnancy." Also known as "Fei and Nick's Fantastic Adventures through Pregnancy." This week we'll be taking a whirlwind tour of how the body changes with pregnancy. This week we'll be talking about the immune and hematologic systems, with the cardiovascular, pulmonary, renal, and GI systems to follow. Today's topic will be a follow up of last week: diagnosis and workup of secondary amenorrhea. This will be a broad overview, with much more detail to follow in the future! Today's topic will be a broad overview of the diagnosis and workup of primary amenorrhea... don't worry! There will more to come on each of the topics that we touch on down the line.